Although rain forest is characterized as pyrophobic, pyrophilic giant eucalypts grow as rain forest emergents in both temperate and tropical Australia. In temperate Australia, such eucalypts depend on extensive, infrequent fires to produce conditions suitable for seedling growth. Little is known, however, about constraints on seedlings of tropical giant eucalypts. We tested whether seedlings of Eucalyptus grandis experience edaphic constraints similar to their temperate counterparts. We hypothesized that phosphorous addition would alleviate edaphic constraints. We grew seedlings in a factorial experiment combining fumigation (to simulate nutrient release and soil pasteurization by fire), soil type (E. grandis forest versus rain forest soil) and phosphorus addition as factors. We found that phosphorus was the principal factor limiting E. grandis seedling survival and growth in rain forest soil, and that fumigation enhanced survival of seedlings in both E. grandis forest and rain forest soil. We conclude that similar to edaphic constraints on temperate giant eucalypts, mineral nutrient and biotic attributes of a tropical rain forest soil may hamper E. grandis seedling establishment. 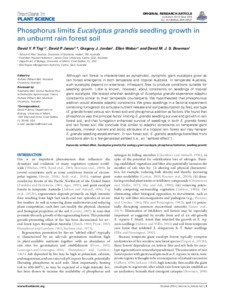 In rain forest soil, E. grandis seedlings benefited from conditions akin to a fire-generated ashbed (i.e., an "ashbed effect").